Embroiderers' Association of Canada, Inc.: Christmas is my favorite time of year! Christmas is my favorite time of year. I know that a lot of people say that, but there's a good reason for it. It's magical and sparkly and warm and wonderful all at once. It's a time when you feel like love is literally in the air, when you see family and friends and think about those that you won't be seeing. It's tied into many wonderful traditions, some of which are shared by all who celebrate Christmas and some that are very personal to each of us as well. 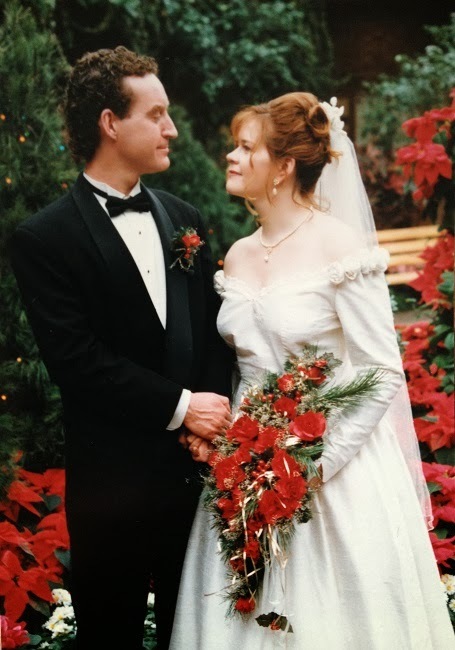 I love it so much, in fact, that when my wonderful husband asked me to marry him, over 19 years ago now, I told him that I wanted a Christmas wedding. And the following year, that's what we had - with a tree decorated with hand-made ornaments (each guest got to pick one as their wedding favor), vinetarta (Icelandic Christmas cake) as our wedding cake, bridesmaids in green dresses carrying red roses and holly and lots and lots of good cheer. It was perfect. One of my favorite Christmas traditions is to make a Christmas ornament for my husband each year and one for each of our wonderful sons, Boone and Liam (this photo is of two "Love Knots" that I made for the boys - that year I made a Love Knot for each of our nieces and nephews as well). Almost always, these are stitched ornaments and sometimes they are even my own design. This year I'm working on Punto Antico ornaments for each of them, something with metallic braid and crystals to add to the sparkle of the season. I hope they like them! Another tradition that I love is Christmas baking. Let's be honest - I just love baking, so adding Christmas to that is like icing on the cake (so to speak!). My favorite is cookies. There are so many wonderful kinds of cookies to make it's hard for me to choose some days (although my hubby says that you can never go wrong with chocolate chip and I have found this to be true). This year, my family has requested cinnamon buns for Christmas brunch, Nanaimo bars (like I didn't see that one coming!) and chocolate chip cookies. All classics in this house. But one of my favorites is a little different - Lavender Cookies. You can find lavender flowers (yes, you can really eat them!) at some bulk food stores in their spice section. It has a wonderful scent that's even better when you combine it with butter and sugar and bake it - heaven smells like this, I'm sure of it! This is a recipe that I found that didn't work out well the first time, but I modified it a bit and now I think it's wonderful (I usually make a triple batch and round up the butter to a full pound). I hope you find it wonderful too! Note: The rolling sugar can be plain or half white sugar and half lavender colored decorating sugar.